Oh my God. Even though I finished this novel a week ago, I had to give this review some time for it not to turn out completely negative. I actually suffered while reading and I’m saying this as a huge fan of Ayatsuji Yukito’s novels. Both his detective mysteries and his horror mysteries were so much fun to read (even though some might have dragged a little at certain points), but Another gave me a truly hard time liking it. This is about 670 pages of nichijôteki horâ (horror that occurs in the everyday setting) that I was probably unable to properly feel myself into because I never had a typical Japanese adolescence, including middle school, peer pressure, urban legends and so on. This and the fact that most of the tension was relying on characters not talking to each other for the sole reason of “the time has not yet come”. I have to admit (and I agree with mousoukyoku here) the finale was clever and the trick that he revealed in the end was kind of cool. But for a novel that spans almost as much as a typical Stephen King novel it featured neither a terribly tight plot nor a huge amount of additional information. The basic story could have been told as a short story of maybe 50-70 pages and character development is almost non-existent with the exception of the lead characters. It kind of reminded me of the problem I had with some of King’s late 80’s early 90’s novels, especially Misery, where he also centered his whole book around one creepy premise. Once the novelty of it wears of you actually only wait for it to end. Maybe this is one of those stories which work better in a tighter frame, which is why I’m actually kind of excited for the anime and live action adaption. The manga did a pretty good job of summarizing certain long paragraphs in just one or two speech balloons while actually concentrating more on how to show events instead of telling us about them. Do I want to say the book is horrible? Probably not. Do I recommend this book then? Probably not either, unless you are a die-hard mystery and/or Ayatsuji fan. This is gothic horror to its extreme, where it is only about transforming the everyday decay and dilapidation into a grand epos of horror and tragedy. An extreme that I can’t really say I like all that much because it just doesn’t reward you with as much as you have to invest into this work. That’s kind of sad and that’s why I’m so hard on the novel, I think; because Ayatsuji can do better and he showed many instances where he was apparently planning on doing something greater but either he or his editor decided otherwise. ~ by seizonsha on 2012/01/16. Hey, I was wondering if you’d be willing to e-mail me the summarized story/ending of this? My Japanese vocabulary is (almost) non-existent. I’m intrigued by how you suggested that the story might work as a short better than a novel. Never thought Japanese novels could be compared with King. Great that you read King though, always great to find another fellow fan. Amazing, too, that you can be so linguistically apt as to be able to read an entire novel in one language and review it in another. Sophisticated review, by the way: might you be a Lit major, or a journalist? I could do this, no problem. In case you’re watching the anime adaption you should be aware that it will pull the rug from under most of the series’ tension. Doing a short summary could take me a few days though, especially with some comments on how it could have worked better as a short story. King is actually a pretty big influence in Japan’s mystery and horror scene. 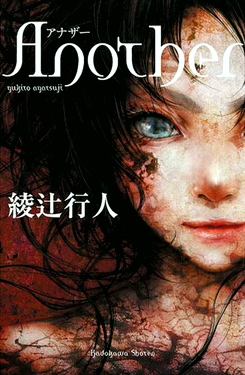 Ayatsuji’s wife Ono Fuyumi (known for her 12 Kingdoms series) wrote her horror novel Shiki as an homage to ‘Salem’s Lot, or pretty well known Miyabe Miyuki has drawn some inspiration from him as well. And thank you for the compliment. Especially because English isn’t my native language and I always feel a little insecure about that. I’m a Japan Studies major with focus on contemporary culture and was an English minor with a focus on American/English contemporary literature. Being a journalist…I’d actually like that. You should not be insecure. Truth be told, you even write better than more than half of my friends whose native language is English. Your English is impeccable… well, almost. There are some mistakes like this one: “Once the novelty of it wears of you actually only wait for it to end.” (I believe you meant “Once the novelty of it wears off, you actually can only wait for it to end”) All your mistakes are really minor ones and I believe they’re only typographical errors, so at the end of the day, it is still undeniable that your English is good. Besides, no one’s perfect. I make typos to. I had no idea Ayatsuji’s wife wrote horror, too. It’s unexpected to hear that King is a Japanese influence. The culture itself has such a deep-rooted belief in ghosts and malevolent spirits to begin with, (if I’m not mistaken, and I believe I might be, are they referred to as mouryou?) including their trademark horror works like Grudge and Ring. Hello, I was wondering if you would mind sending me the summary as well. I’ve been wanting to read this novel for awhile now, but I can’t seem to find a translated version online anywhere. I would really appreciate it if it wouldn’t be too much trouble. My email is gto69@earthlink.net. I really don’t have the right to say anything about the novel because I couldn’t finish it, but I’m still going to. For me, it was interesting at first, but the amount of “it’s not yet time” conversations just overwhelmed me. I couldn’t bring myself to finish the novel because of that. The novel was just too draggy for me and patience is a virtue I have yet to learn. To be honest, I usually don’t have any problem reading long novels, but as you have said, the story could have been told in just 50-70 pages. The immense amount of “unnecessary pages” made me think that the whole book itself is just unnecessary. I just lost interest. 1. I have to admit (and I agree with mousoukyoku here) the finale was clever and the trick that he revealed in the end was kind of cool. 2. Maybe this is one of those stories which work better in a tighter frame, which is why I’m actually kind of excited for the anime and live action adaption. Number 1 makes me want to go get the book and give it another chance, while number 2 makes me like the anime even more. Again, thank you for this very well-written post. Thank you for the replies and sorry to everyone who’s waiting for the summary. I’m about to depart on a semester abroad in Japan and things are a little more hectic than I anticipated. The summary is almost ready, just a few minor tweaks to make it as easy to follow as possible. I think I should have some time to do that the following week. Thanks for being patient. Hi! I started watching the anime and im very interested on the story but sometimes it is a bit messy. I have tried to find an english version of the novel but it is only in Japanese. As I have read that you are making the novel summary i would appreciate you if you could please send it to me too. My email is beatriz_fl@hotmail.es Thank you for all the trouble. This is probably going to annoy the heck out of you since pretty much everyone above me requested the same thing, but if you ever have the time, could you also please send me the summary of this thing? I’m so curious. My e-mail is: insomnimaniac@live.com. Have fun on your semester abroad in Japan. I’m mighty jealous of you. Hi, I am so so so curious about this novel and I have been searching for the summary as well (unfortunately, i couldn’t find any! :(). Do you mund sending me a copy too? Here’s my email: apacahig@gmail.com! Hello~!! Can I please have a copy of your shorten Another novel. Hello. Can you email the book Another, please? Does the Another novel you have comes in English of Japanese? If you have only one language, I’m find with it; I can read both languages. I’d been searching for this novel for so long. It would be really great for me if you could email it to me. Hello. Can you kindly send to me a English of Another? I like this novel a lot. Even I already read manga and anime many time but I still want to expect this novel. I found this novel a long time on internet without any result. Please kindly send to my email: shinbet@outlook.com.